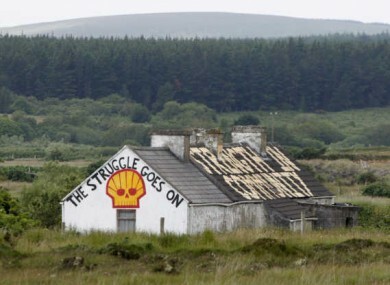 In October 2006, we visited Mark Garavan, spokesperson for the Shell to Sea campaign, at his home near Castlebar in County Mayo, Ireland. For over six years Shell to Sea have been objecting to plans for a gas refinery and its associated pipeline in Bellanaboy, the town land designated as the location for the refinery. The Shell to Sea campaign believes the refinery should be sited at sea for health and safety reasons, which is ordinary practice in many parts of the world and because of the devastating impact the refinery will have on the area if it is built. They have also pointed to the financial and economic deficits in the arrangements made between the Irish government and the exploration companies Shell (Dutch), Statoil (Norwegian) and Marathon (UK) and the anomalies they perceive in the way the project has been given approval to proceed. The processes by which permissions have been given to the exploration companies have also been a serious cause for concern amongst local people – with many questions outstanding on planning, health and safety issues in particular. On release from hospital later the same day she was invited to speak on Joe Duffy’s ‘Liveline’ radio programme on RTE, the national Irish broadcasting organisation. The Shell to Sea campaign had enjoyed the support of much of the media following the imprisonment for 94 days of five local farmers (The Rossport Five) who had objected to the plans and who were found to be in contravention of an injunction against them. Duffy’s interview was a striking example of how the media had turned on the protest in the year that had elapsed since the release of ‘The Five’. We were interested in the dynamics of the relationship between the Shell to Sea protest and the media. In our discussion with Mark Garavan he gave some valuable insight to the realities of protesting against an alliance of multinational corporations and the political establishment operating with the support of a media that is mostly sympathetic to corporate objectives. That invasion and all the subsequent crimes within have amassed over 650,000 bodies, with one recent addition, the former leader of that country. The Lancet has reported that “Since March 2003, an additional 2.5 percent of Iraq’s population have died above what would have occurred without conflict.” This translates to 655,000 dead Iraqis as a direct result of US led invasion. Ireland was used as a refueling point for the US war machine. Therefore the Irish government knowingly facilitated the illegal invasion and occupation of a foreign country. Given the gravity of this information I was extremely surprised to witness the Irish news media’s coverage of this report. As far as I am aware RTE, the national broadcaster and to whom we pay our license fee, has not mentioned the report. Not even a peep. To my embarrassment I was to be informed the study had been reported ‘extensively’ a day earlier, though I could possibly be forgiven for missing it. Thank you for responding. I was unaware of this extensive coverage as I rarely listen to the radio. I rely heavily on RTE’s website and the frequent television news slots for information on local and world news. It appears quite an oversight to restrict coverage of this shocking report to one 4 1/2 minute slot on a 2 hour morning radio show. I have to say I am no less surprised at RTE’s failure to cover these findings. The remainder of Mr. Simpson’s contribution was similarly weak. He said the figure is ‘enormous, but uncheckable’ and again ‘pretty uncheckable’, leaving us in no doubt as to his position on the subject. The RTE presenter* joined the chorus, ‘[it is] impossible to go around and check’. RTE transmit approximately 5 hours of news broadcasting through it’s television and radio media everyday, this is also supplemented through it’s substantial web presence. It is now over three months since this updated estimate was published, and this 4.5 minute interview on a morning radio show and one fleeting glance during a Prime Time discussion represents RTE’s ‘extensive’ coverage of those 650,000 deaths**. Thanks for your mail and your interest in the site. The section you referred to is re-edited copy from Reuters. There is contention about the number of civilian casualties in Iraq but we strive to be accurate with our News coverage and ‘tens of thousands of Iraqis have been killed’ is accurate. However, I don’t see how the fact the text was copied from a Reuters piece is relevant to the issue. Contrary to your contention, there is no reasonable or scientific refutation of the study’s findings. The ‘contention’ you referred to is, as you are no doubt aware, politically motivated and should have no bearing on RTE’s responsibility to report the facts to the best of their ability. Also contrary to your assertion, the phrase ‘tens of thousands of Iraqis have been killed’ is about as accurate as writing post 9/11, “tens of Americans have been killed.” The latter would never appear in a respectable newspaper and neither should the former. I remain hopeful that you will address this inaccuracy. The media’s abject failure to highlight this obvious and yet extraordinary disparity signifies yet another home-run for the ‘local highschool team’. As media consumers we need not concern ourselves too much with the crimes of the ‘visiting teams’, such as despots Saddam Hussein, Robert Mugabe or Kim Jong-il. The dominant media has proved itself reasonably proficient in recalling their bad deeds (at times even exaggerating them). It is the crimes of our team and those of our allies that we must concern ourselves with. We must expose these crimes if we are to challenge those that seek to usurp democracy from the democratic. It is argued that figures on the scale posed by the Lancet study are not necessary to brand the invasion of Iraq a tragedy. Though we would argue that, as allies of the criminals responsible, we should be concerned with the scale of this ‘supreme international crime’, and leave pity to those who have done all they can to end complicity in mass murder. Please write to RTE to ask why they continue to neglect those deaths which compromise Ireland’s neutrality and the world’s security. * Both Richard Downes and Cathal MacCoille present Morning Ireland.